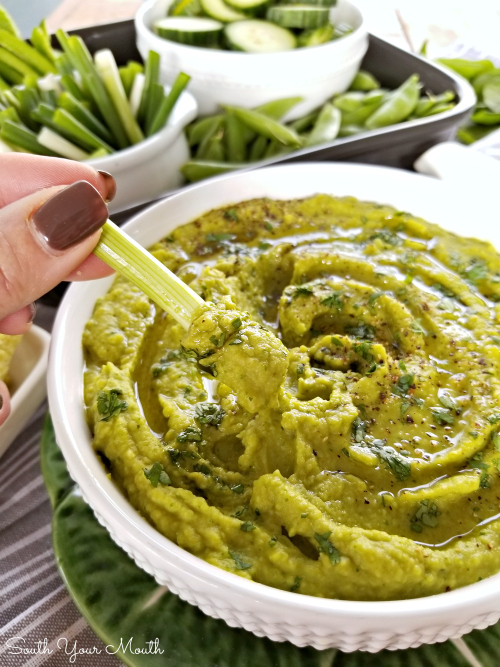 A vitamin-packed, superfood hummus recipe made with green peas and spinach. The Angel Baby LOVES hummus. The first thing she ever learned to “cook” was hummus from a children’s recipe book I bought her for Christmas once upon a time. She wanted to make her own because she’d gotten so used to homemade and the good stuff in restaurants, she really didn’t like the store-bought stuff (me either, girl, me either). 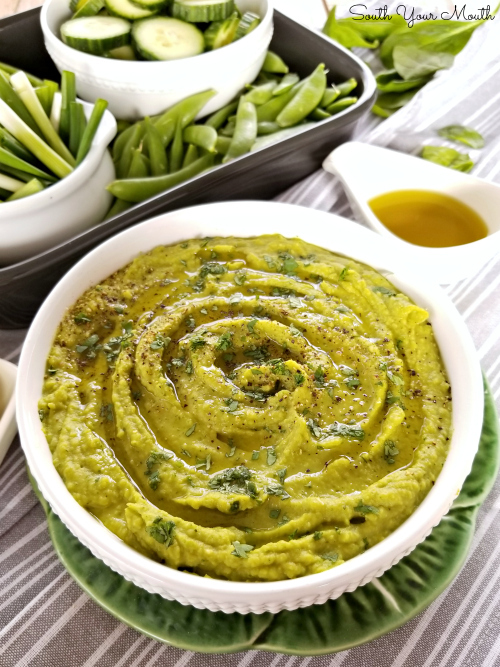 Her love for hummus hasn’t waned so fresh hummus is something we have around a lot! We’re all trying to eat healthier at my house. I gained like 11 pounds since Thanksgiving 😐 (not even kidding) so I’ve been trying to make salads more exciting. I bought a bottle of Green Goddess salad dressing and you’d think I just reinvented the wheel! 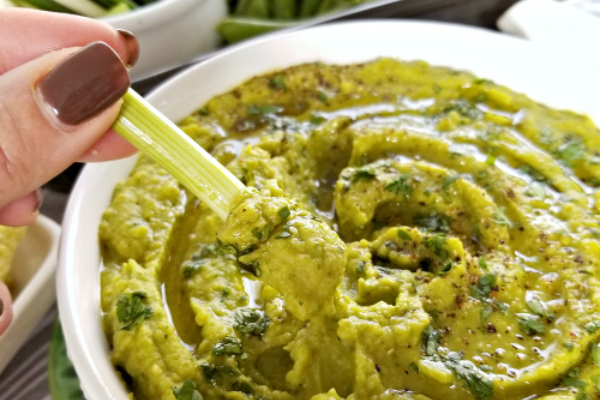 My peeps are scarfing down anything they can dip in the dressing so I thought I would capitalize on their enthusiasm and make a Green Goddess Hummus. Since we’re all suckers for a theme, I served it with a platter of green-only veggies. It was a HUGE hit! They were all so into the GREEN theme they didn’t seem to notice they were eating healthy stuff. And the best part? The hummus was AMAZING. This recipe makes a huge batch and we’re barely have any left after eating on it all weekend. Check out the health benefits in these superfoods! Protein provides the building blocks needed for cellular growth. It also provides the body with an important energy source. Iron – Iron, found in red blood cells, is an integral part of hemoglobin. Hemoglobin carries oxygen from the lungs to the cells. Iron is an essential component of many enzymes necessary for various chemical reactions in the body. Manganese – Manganese aids in the metabolism of food as well as promotes normal functioning of the nervous system. Manganese works as an antioxidant to help prevent cancer and heart disease. Magnesium – Magnesium helps to keep muscle and nerve tissues functioning normal, as well as promotes a proper heartbeat. It also assists in the support of a healthy immune system and keeps bones strong. Omega Fatty Acids – Omega fatty acids are unsaturated fatty acids which help reduce the risk of stroke and promote healthy heart and circulatory functions. Combine dried peas and water in a large pot. Set aside seasoning packet to add later. Bring water to a boil, cover pot then reduce heat to medium-low and cook peas for 20 minutes. Add seasoning packet then continue cooking for 10 minutes or until peas are tender. Drain peas then allow to cool for 30 minutes. Do not rinse. Add garlic, tahini, spinach, salt, cumin, lemon juice and 1/4 cup of olive oil to a blender then pulse until spinach is pureed. Add well-drained cooked peas to blender then blend on a low setting until smooth. Add additional olive oil if needed to get a creamy consistency. Taste for salt then add more if desired. Pour into a serving bowl then refrigerate until chilled. To serve, drizzle with more olive oil then top with fresh cracked black pepper and finely chopped cilantro or parsley (I love cilantro so that’s what I use). 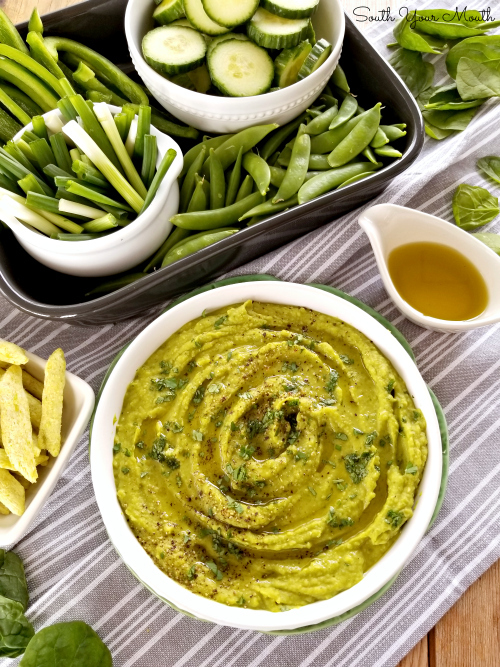 Serve with an assortment of veggies and/or pita. I got my crew to eat ALL SORTS of green veggies by serving it the way I did here. I used only green stuff so they get excited about the green theme. Refrigerate to store in an airtight container up to one week. Most lemons yield about 1/4 cup of juice but I usually buy two just in case one isn’t enough. Tahini is a sesame seed “butter” or paste that is very common in hummus. Sometimes I have a hard time finding it so I’ve often made my hummus without it. It’s better with the tahini but it won’t be the end of the world if you don’t use it. 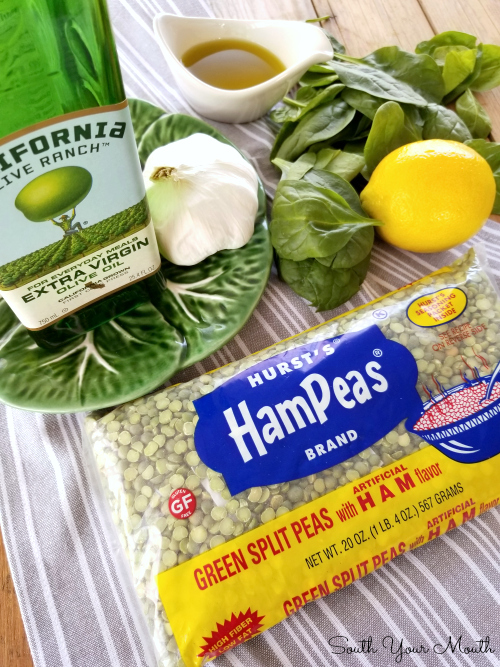 I loved using the Hurst’s Green Split Peas with Ham Flavor rather than plain split peas because that tiny hint of smoky flavor is DIVINE with this hummus (I cooked it with 10 cups of water to ensure the flavor wasn’t overwhelming). 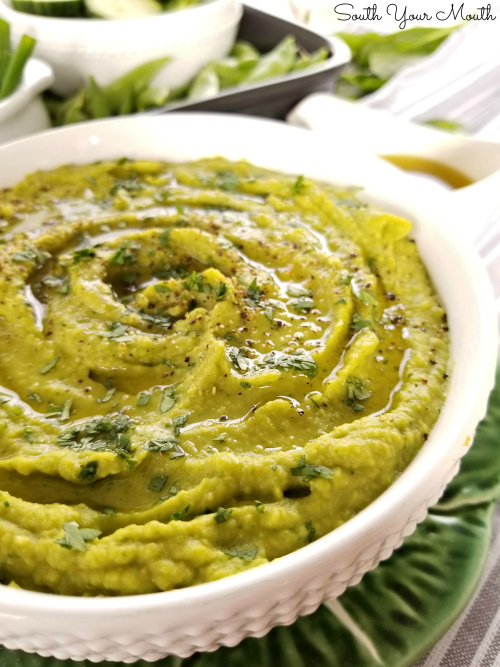 You can make this using a food processor if you prefer but I think the spinach processes better and things are just generally smoother when I use a blender. I snipped the stems off my spinach to ensure things were extra smooth. When measuring the spinach, just keep adding leaves into your measuring cup and packing them in there until it’s full. Add fresh tarragon to yours if you want it to taste more like the actual Green Goddess dressing. I have both your cookbooks and wondering if this recipe is in either of the books? I forgot to ask what recipe is at the top of your blog, the shrimp dish, it looks so good! That's the Shrimp and Grits!